This article was written By Rex Baylon on 18 May 2011, and is filed under Reviews. Manuel and Dado are simple men. In fact, one could argue that they are simpletons. Part of the ever-increasing Philippine migrant worker community, not just in Taiwan but also all over Asia and the world, they live a lonely life apart from their friends and family back home. The money they send back fuels a national economy that seems to have always had a dependence on foreign currency. During the day, they work blue-collar jobs at a bicycle factory, while at night they pass the time by flirting with women or drinking beer. The monotony and constant threat of deportation would drive anyone crazy, but the trade-off is not so bad. An overseas job means larger pay, which in turn allows these men and their families to enjoy simple luxuries like brand name toys for their children, nice clothes, and store-bought sushi. Many Filipinos would envy Manuel and Dado, but ironically all these men want to do is go back home. 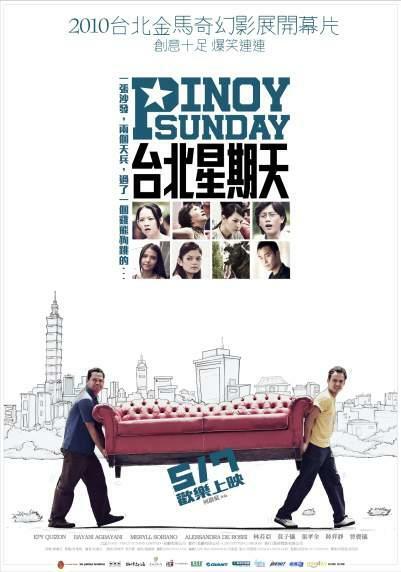 Wi Ding Ho’s Pinoy Sunday (2009) is, in every sense of the word, a true pan-Asian production. Written and directed by a Malaysian director, shot in Taipei, starring Filipino actors, and funded by NHK and Les Petites Lumieres, the film stands as an example of globalization at its finest. And although the film takes on a serious social issue, the boon provided by guest workers from third world countries like the Philippines into more highly developed/economically stable nations like Taiwan, Japan, South Korea, Europe, and the United States, the first time filmmaker never employs emotionally cloying techniques to gain some free publicity for his movie. Shot in a magic-realist vein, Ho and his cinematographer Jake Pollock take to the streets and although they utilize the daily bustle and noise of Taipei to add a certain depth of realism to the film, audiences should not mistake Pinoy Sunday for some sort of tourist romp. One of the most famous landmarks in the Taiwanese skyline, Taipei 101, formerly known as the Taipei World Financial Center, is reduced to a tiny dot. Ho and his crew, to ground the film in a familiar milieum, utilize a street level perspective, but they are never bogged down in capturing reality just for reality’s sake. There are moments in the film when the narrative will just veer off into the realm of the fantastic, bordering on Jeunet-style comedic quirk, like during fantasy sequences in which each man imagines how awesome their lives will be once they bring their couch back home. However, Wi and his co-screenwriter Ajay Balakrishnan restrain themselves from getting bogged down in tired gimmicks. Ultimately, what sells the entire cinematic affair are the two leads, Bayani Agbayani and Jeffrey Quizon (credited as Epy Quizon). Comedy superstars back home in casino online the Philippines, it is a miracle that a first time director could lure these two men away from the cushy gig of TV variety show appearances and big budget film spectacles, especially since Epy Quizon is the son of Dolphy, the King of Filipino comedy, whose own film career stretches as far back as the 1940s. Neither man was starved for money or attention, yet their willingness to take a risk on Wi Ding Ho’s script and talent is a positive sign that Hollywood doesn’t have a complete monopoly in the Filipino film industry. Taking a cue from such classic buddy duos like Martin and Lewis or Abbott and Costello, Bayani and Epy play country bumpkins with neither the brains to get ahead nor the ambition to achieve much more than a paycheck. However, their simple desire to bring a red leather couch that they stumble upon in the street, abandoned by a young quarreling couple, back to their dorm humanizes these imbeciles from becoming just one-dimensional caricatures. Dado (Bayani Agbayani) is the pudgy realist, constantly waiting for the other shoe to drop, and so weak-willed that he eventually abandons the couch of his dreams to make curfew. And though constantly worried about his wife and kids, he has no qualms about shacking up with another woman. In Dado’s defense. the relationship was born out of a necessity to combat loneliness rather than true love. In stark contrast to Dado’s pragmatism. Manuel is a romantic dreamer. Clothed in brightly colored t-shirts, tight pants, and sporting a tramp stamp, he spends the first half of the film trying to woo a barroom chanteuse, but when that fails he quickly devotes all his attention to dragging his beloved red couch back to his rooftop sanctuary. Both men have made a lot of compromises to come and stay in Taiwan and though the script shows Dado and Manuel to ultimately be simple fools, Wi does not allow the Taiwanese to walk away unscathed either. Presenting the native population as cruel, xenophobic, and petty while the Filipino expat’s are naïve, polite to a fault, walking penises that are controlled by their urges is reminiscent of the age-old conflict between traditional societies and modernity. Manuel and Dado are strangers in a strange land who are really out of place in the city and though the trend has been to utilize progress as the main reason for globalization, a prime example being a pan-Asian production like Pinoy Sunday, Wi Ding Ho presents this headlong rush towards economic prosperity as the major factor in corrupting newly arrived third world immigrants and also the major cause in the emotional stagnation of its first world citizens. Watching Manuel and Dado cart around their red leather couch through Taipei, it’s difficult not to root for them. Their success would be a reaffirmation of all they had abandoned, but ultimately we know better. Happiness doesn’t come from couches or the momentary pleasure that comes from store-bought hamburgers. It is an untenable state of mind, beautifully captured by Wi as both men, finally tired of trying to keep their fantasy literally afloat, give up. Finally allowed to enjoy their couch, Manuel and Dado toss back some beers, pull out a guitar and bongo drums, and begin to play. The upbeat lyrics and melancholic tune perfectly encapsulating both these men’s bittersweet failures. You can”t help but hope that they sail away to parts unknown, finding happiness in their own lives someday.